Forget CO2, US Debt "Causes" Warming | Watts Up With That? Total US Debt (public and private) as a percentage of US Gross Domestic Product (GDP) correlates with NASA GISS US Annual Mean Temperature Anomaly better than CO2 levels! So, if we want to reduce warming, cut the debt! The base chart tracks Total Public and Private US Debt as a percentage of GDP (black line) from 1870 through 2009. Notice how it slowly increases from 1880 to 1930 and then peaks sharply in the early 1930’s, declines through the 1950’s and then rises steadily through 2009. NASA GISS data for the US Annual 5 year Mean Temperature Anomaly from 1880 to the present is superimposed (red line), and fits remarkably well. It is a bit noisier, but it too increases from 1880 to 1930 and then peaks sharply in the early 1930’s. It then declines through 1970, and then rises steadily through 2010. Notice how CO2 levels (dotted blue line), estimated from 1880 through 1957 and based on Mauna Loa from 1958 through 2010, fail to indicate any peaking in the 1930’s. 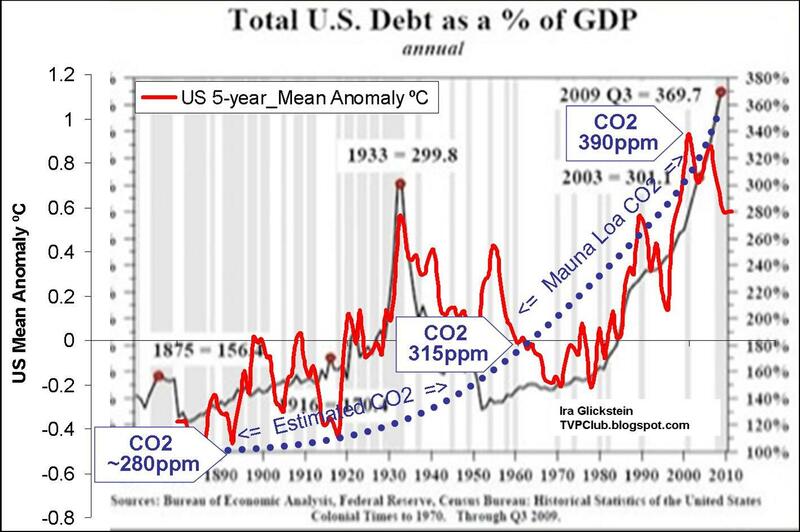 It is amazing how the Warmists point to human-caused CO2 as the primary cause of Global Warming when Total US Debt as a Percentage of GDP matches so much better! Perhaps cutting the GISS budget will do more for the Warmist cause than wrecking our economy by cutting energy use and sequestering CO2? Let us save the environment by increasing US productivity and reducing deficits! 2) Correlation does not prove causation, and CO2 does not even correlate all that well as the cause of warming. Therefore, human activities, while most likely responsible for some small part of recent warming (see this) are overwhelmed by natural cycles and processes, responsible for most of the actual warming since 1880. Indeed, the greatest human cause of the supposed warming has been Data Bias, due to “adjustments” and re-analysis by NASA GISS. Here in the UK, we are a little worried about our debt – though we have just started to make huge cut-backs so we at least tackle our budget deficit. But I was astounded to see the US debt and the deficit! I thought the figures were wrong, so went onto another website. Absolutely amazing, how do you all sleep at night? On your global warming is a pussycat thread you claim that there is only 0.5 C of global warming, and 0.3 C is from data adjustment in GISS. Yet the warming in UAH and RSS is ~0.5 C since ’79. Since I doubt even most WUWT commenters think that Roy Spencer is adjusting the satellite data because of airports in space, does that mean that there was hardly any warming or cooling before 1980? Also, I like your trick of using US temperature records and ignoring how theory talks about total forcing rather than just one. Solar activity hardly correlates at all with warming over the past 40 years (when we have satellite data), yet I doubt you’d say that because of this it should be ignored, right? Why did CO2 spike in the great depression? 1930s was a warm period, warm means CO2 goes up. CO2 is a sign of increased life on the planet, it is not a threat. And here all this time I was convinced that the warming was “caused” by the number of shoes in my wife’s closet. As the number of shoes has gone up, so has the temp. It’s gotta be the shoes!!! The U.S. reneged on its national debt in in 1933 (http://spectator.org/archives/2009/01/21/was-there-ever-a-default-on-us/) which clearly caused an abrupt decline in global temperatures. Clearly it is time for the U.S. to renege on its national debt again. This will be at least as effective at reducing global warming as a carbon tax. (not sarc). Since CO2 is massively beneficial, does that mean the National Debt should be maximized? The complete and total economic collapse of the USA and the world is a mathematical certainty. Buy Silver, Guns, and Gold. There’s not much time left. I know this sounds alarmist, but history shows this is what happens to a fiat currency once the debt goes parabolic 100% of the time. What this really means is that the Mauna Loa records do not accurately reflect our varying CO2 emissions. In reality our emissions go up and down in line with our economies and debt rises and falls along with the economic cycle. The truth is therefore that our CO2 emissions and our economies do track temperatures far more closely than the Mauna Loa record reveals. I like the conclusion — if we want to reduce warming, cut the (US) debt! hahaha. cheers! WAGTD!!! It’s WTWT!!! Where’s the money? sarc off! Fifty years ago when I was doing statistics our lecturer claimed that most things could be correlated with the growth in the sales of white sliced bread. What is the correlation coefficient (r2) between T and CO2 and between T and US Debt? Will the U.S. economy hit it’s tipping point? Will the Arctic sea ice reach it’s tipping point? I’d wager the former will be a certainty. Don’t I recall that US postal charges and leprechauns also have a hand in this? Increased income means increased borrowing power. At a population level, everyone borrows almost to their limit. Increased (fossil fuel) energy consumption increases productivity and hence income, and hence borrowing. The connection is fairly direct. Yule must have been the straight man for Henny Youngman. I still prefer to blame Apple and the drones that “must” buy the latest and greatest magical iCandy that is offered to them for the recent warming. If crack dealers or government politicians ever learn to market like Apple then we will be doomed. Government spending is a fun correlation though. I like that…man made global warming is real after all because it was Men (mostly) who took the data and altered it upwards….very good. Be careful or you’ll be giving the alarmists ideas of claiming AGW to be a cause of debt. After all, it causes everything else from anger to xenophobia. Managing the global climate by controlling CO2 and managing the US debt by controlling Congressional spending seem to have about equal chances of success. I would not bet on slim. Brilliant idea. Lets start with all the climate agencies. That would save $billions. Then if we start cutting all the spuirious green schemes, that will save $trillions. Guess what, hey presto, we reduce all the debt and the warming. Wonderful. Of course, it is cheap to dream. I painted myself into an ellipse the other day. I did get hotter. Something for you to ponder on. Whilst I have a dislike of graphs with too many plots, it would be interesting if you could add to your graph a plot of manmade CO2 emissions (or fossil fueel usage/consumption) since this would show that Mauna Loa does not even properly follow manmade emissions/consumption. One of the things that interests me is this debate is the size of the CO2 sinks in 2010 and say 1980 and 1970. Were the CO2 sinks smaller in say 1980, 1970, and if so why? Has the rate of absorption changed over the years and if so why? This is material, since if the CO2 sink in 1970 was broadly the same size as the sink in 2010, why did it not absorb all 1970 manmade CO2 emissions since potentially, it would have had capacity to do so? We have just been through a world wide recession, and it would be interesting to compare manmade fossil fuel consumption/CO2 emissions for the years 2007,2008,2009 and 2010. I suspect that these would show a drop in consumption/emissions in 2009 and 2010 compared to say 2008. If that is so, can we see this drop in Mauna Loa measuremenst? If not, why not? These are important issues to answer if we are to evaluate our influence on CO2 levels in the atmosphere. You are right about the illusionary nature of the cuts. What is more strange is that the illusion has taken on a reality even though it had been stated over and over that the spending plan for 2015 will be higher than it was in 2007, 8 or 9. The stark and shocking truth is that it would be politically impossible to make the cuts that many opponents are imagining. The Government know this and have cleverly positioned themselves just enough to the fiscal right of the opposition to be able to claim when the debt explodes in 2015 (more likely sooner) that “Well, you people were complaining that we were cutting too much so you can’t blame us.” But if by some miracle we manage to grow ourselves out of the debt crisis, they can simply take the credit for good economic management. The only losers from this Faustian bargain will be the British people. This is horrible news. If temperature correlates to US debt it’ll be 100°F during the winter by 2037, when social security flatlines. China’s GDP growth made news this week because, on the official figures, China overtook Japan to become the second largest economy in the world in 2010. But actually, on a different way of calculating the data, this was very old news. Using purchasing power parity, China not only overtook Japan way back in 2001, but it is also quite close to overtaking the US as the biggest economy in the world – if, indeed, it has not done so already. Stephen Brown, I’m indebted to you, thanks for the correction, and the eye-opening. Obviously what is happening is that warming causes economic growth and thus gives rise to debt. Cooling leads to lowering of animal spirits and retrenchment. You are drawing completely the wrong conclusion. To lower debt, cool the planet! It is clearly the only practical and effective way of doing it. The temperature record has flattened out in the last decade, while the USA has gone on another spending spree. I love the logic of Western economics. We printed and borrowed too much money, causing a financial crash. So to cure this problem we shall … ahhh … print and borrow a whole load more money. >>Why did CO2 spike in the great depression? >>of increased life on the planet, it is not a threat. The CO2 line is the blue dotted, which does not match the temp graph at all. That is the whole point of the thread. Re: UAH temperature anomaly. I assume you mean this plot. Guvmnt exists to create in us need for their services. CO2 is a greenhouse gas. That is a scientific fact that cannot be dismissed, and there is ample scientific research to support that. There are other factors which contribute to temperature changes, but we know debt is not one of them. The whole point of this post is completely lost on me. You have made your point about spurious correlations. Whilst this is fun (although it is not altogether surprising that there may be some correlation between say the consumption of chocolate bars and temperatures), on a scientific blog such as this, a more interesting discussion would be the correlation between CO2 and US temps. This would encompass a number of issues in particular: (i) to what extent do the Mauna Loa figures plot manmade consumption of fossil fuels/manmade emissions of CO2? (ii) If CO2 is an evenly dispersed gas and if it has greenhouse properties, why does the US temp record not correlate with the increase in CO2 levels? (iii) Given that the US is a very substantial land mass, do the climate models that predict global warming show that the US will warm only in line with the US temperature records rather than in line with the global records? (iv) If they do not show this response for such a significant land area, is this an example of a significant flaw in the models? (v) Ditto Central England (albeit that Central England is not a large land mass). (vi) How does the greenhouse theory fit in with known temperature records that diverge from the ‘robust’ science that more CO2 leads to higher temperatures? I don’t want to highjack your post, but I think that the point made by Stephen Wild at 01:20 am which crossed with a similar point made by me at 04:02 am is a more interesting and indeed more pertinent issue and could perhaps form the basis of a future post. Just in case you are not clear as to my reasoning behind the point I make at 04:02 am, I briefly expand. 1. Between 1960 through to 2000, Mauna Loa shows an almost linear increase. I haven’t checked the data but recall that the increase is about a little less than 2ppm per year. 2. There would only be an increase in atmospheric CO2 levels in any given year if the CO2 sink in that year was not able to absorb all naturally out gassed CO2 plus all manmade emitted CO2 in the year in question. 3. The shortfall in the absorption capacity of the sink in the relevant year would be the amount of increase in CO2 measured by Mauna Loa that year. 4. Thus in 2009, the size of the sink is the total quantity of naturally out gassed CO2 (that year) PLUS all manmade CO2 emissions LESS whatever quantity of CO2 would result in an increase of 2ppm in atmospheric levels. 5. Having calculated the potential size of the natural sink, look back at say 1960. What was the quantity of naturally out gassed CO2 that year? What was the quantity of manmade emissions that year? The total of these two figures is almost certainly going to be less than the size of the sink when calculated in accordance with 4 above. That being so, why wasn’t all the 1960 manmade CO2 emissions absorbed? What is it about the 1960 sink which did not result in the absorption of a total quantity of CO2 similar to that which was absorbed by the 2009 sink? Speaking for some of us in the U.S., we don’t sleep at night. One can only hope that the current administration wakes up, and soon, to the enormity of the numbers and makes MAJOR cutbacks across the board. The idea that a slight warming out of icy conditions, together with longer growing seasons, higher photosynthetic rates, higher airborne water and precipitation, is in any sense a ‘decline’ is something that could only come out of the mind of an ecochondriac. Deficit spending causes debt, and also an overheated economy. All that heat from the economy is transferred to the atmosphere, and warms the planet. The temperature is inversely proportional to the number of pirates at sea, as demonstrate by the relative fall in temperatures since 2001, when the Somali pirates began to expand their operations. What will really blow your mind is that these two patterns are linked. The first naval campaign the United States ever took part in after the war of independence was a successful attempt to subdue the Barbary pirates, during which the US raised its first bit of national debt. Temperatures began to rise at the same time according to the CET record. IT ALL MAKES SENSE! Or perhaps the extreme rise in global temperatures which we are all suffering greatly from (hmmm, must open that window, if only it was not frozen!) caused the debt? Note also that debt is money. Without debt, there would literally be no money. All money (well, almost all) is created as a debt. It must be difficult to be wrong and so depressing about two things in one short paragraph, but you did it. Please provide some proof of both your assertions. CO2 driving the climate pahleesse. At least there is some logic to this correlation. As economic activity goes up so does our national debt. This assumes that government expenditures cause greater economic activity, a theory widely accepted by our present US administration and their economists. It is a fact that we have, and continue, to raise the debt ceiling in order to spend all this nonexistent money. So, given that increased economic activity requires more carbon based energy, it makes sense that CO2 is still the culprit!! Or maybe it’s just the heat generated by all those new buildings, vehicles, industrial facilities, industrial output, etc. that are located near out temperature sensors are the reason why the good correlation with temperature. Has anyone checked hemlines or the batting average of the NY Yankees as these were at one time well correlated with the ups and downs of the stock market, why not global temperature as well. Remember the old warning, beware of implied cause and effect. Never saw an area of “science” that ignored this warning more. YES, I do trust the satellite data in general and Spencer’s analysis in particular. Looking at his graph, take his first January (1980) anomaly, which is -0.1ºC, and compare it with the most recent January (2011) anomaly, which is 0.0ºC, and you get a net warming since satellite data came available of only +0.1ºC, a lot less than the +0.5ºC I have allocated to warming since 1880. If you take Spencer’s first running centered 13-month average for January 1980, which is -0.1ºC, and compare it to the latest 13-month average, January 2010, which is +0.4ºC, the warming is +0.5ºC. If you compare the 13-month average for the same months in 1999 and 2009, you get a cooling of -0.2ºC. Thus, comparing the same month of the year for different years, you can get warming or cooling. Since human activities do not change that much over a year or a decade or two, that proves to me that natural cyclaes and processes are a far greater force in climate change than human activities. Also, while the satellite data is the best we have, the sensors cannot penetrate cloud cover and thus report surface temperatures only under cloud-free conditions. That means they do not directly measure the considerably cooler temperatures that exist under daytime clouds (or the slightly warmer temperatures under nightime clouds). The readings also need to be adjusted according to the time of day the satellite happens to pass over a given location, as well as the deterioration of the sensors over time. In addition, there have been over a dozen different satellites in use at various times since measurements began in 1979, each with somewhat different instrumentation, requiring satellite intercalibration bias adjustments. Thus, while Spencer’s UAH analysis is fine, and far, far better than the GISS and CRU analysed data, I believe it may be off by +/-0.1ºC. Also, I like your trick of using US temperature records and ignoring how theory talks about total forcing rather than just one. I use US temperature records because I pay for and am evaluating US NASA GISS (and other US government agencies that take and process temperature records). Why do you call it a “trick”? It seems to me that US agences have more control and knowledge of US temperature data than anything from other countries, where there may be fewer measurement stations and where other factors may distort the record. If they cannot get it right with US data, modifying their own published data by up to 0.5ºC, see FOIA email, how can they get it right with worldwide data? Solar activity hardly correlates at all with warming over the past 40 years (when we have satellite data), yet I doubt you’d say that because of this it should be ignored, right? As I pointed out here there are many different natural cycles and processes in addition to the Sun. Multi-decadal ocean oscillations are certainly heavy hitters. However, the run up in temperature does correlate to Sunspot number, with SC#20 (~1970, during a cool period) peaking lower than SC#21, #22, and #23. 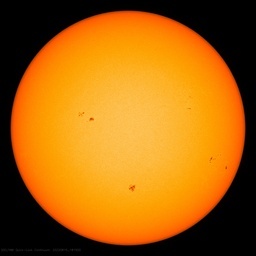 The real test of the contribution of Solar activity will come with SC#24, set to peak at a very low level around 2014. If Solar activity is a heavy hitter, this will result in stabilization of global temperatures and perhaps a bit of Global Cooling. If that happens, desipite continued rapid CO2 rise, I think that will prove that CO2 sensitivity has been way over-estimated by the official climate Team and, therefore, that the human contribution to warming is far less than they claim. Thank you for your comment and I hope you follow up with more. A correlation would likely look pretty good (R2 wise) if you plotted the value of a home in the central valley of CA to temp and CO2 (say till 2006/7- unfortunately after that the correlation falls apart)- oh wait how about if you only start the time series in 2006 and then do the plot of home value to say CO2- that should show a pretty good negative feedback/ sac. Abstract: This publication exposes eight common statistical “traps”. They are: 1. Treating all observed variation in a time series data sequence as special causes, 2. Fitting inappropriate “trend” lines to a time series data sequence, 3. Unnecessary obsession with and incorrect application of the Normal distribution, 4. Incorrect calculation of standard deviation and “sigma” limits, 5. Misreading special cause signals on a control chart, 6. Choosing arbitrary cutoffs for “above” average and “below” average, 7. Improving processes through arbitrary numerical goals and standards, 8. Using statistical techniques on “rolling” or “moving” averages. The USA has to tackle its debt or end up as just another Ireland or Greece, only in this case due to capitalist extremism. The only meaningful way for the USA to cut its budget is to cut defense spending. If you thought taking on a few warmista fanatics was tough just try taking on the American military industrial complex, good luck. Matter at February 16, 2011 at 12:34 am accuses Ira of cherry picking the use of US temperature data. However, I am of the view that this is a valid exercise. What we need to know is where, when and how the globe is warming. The use of a global average temperature has a tendency to fudge matters and conceal what may be important mechanisms in the warming phenomena. I can accept that the way in which temperatures respond may be different at the poles or over dessert where the is less water vapour and thus CO2 bears a larger proportion of the greenhouse gases over those areas. I can accept that the way that the equatorial area and the poles may warm could be different because of the incident of sunlight and duration of the day etc. I can accept that areas of tropical rain forest may respond differently etc. There may therefore be special cases to temperature response. However, outside those special cases, is there any reason (whatsoever) to presume that the behaviour of warming experienced by the US in response to an increase in atmospheric CO2 levels is not typical of the globe generally? The advantage of looking at the US is that it is one area where there is an abundance of station data going back quite a long way. One anticipates that the quality control behind this data may be better than other temperature sets. IF there is no reason why the US should be considered an exceptional case and not typical of the globe generally, it follows that the analysis of the US is extremely pertinent to the AGW debate. Under the current monetary system all money is created for debt. So the owners of this debt, Rothchild, JP Morgan, Warburg have no incentive to see the budget of their “private (federal) reserve” reduced. The bigger the debt, the higher the receivables for those who own the money supply. Anthony that’s a bad note for your GOP support. Over the last 80 years, temps are spiking when a Republicain got the job -while temps are cooling when a dem gets in. And when it comes to correlation don’t forget that women’s hemlines tend to rise in times of national crises. Well known econometric observation. Here in the UK, we are a little worried about our debt – though we have just started to make huge cut-backs so we at least tackle our budget deficit. That statement is a myth (happily propagated in the media and by the opposition). UK government expenditure has increased every month since the Coalition took power. There are no cuts at the overall level. Wrong on both. Just because a 3rd world country has had a growth spurt does not mean the U.S. is “in decline,” much as Mr Brookes wishes it were so. We will get over the Obama disaster just as we’ve gotten over worse problems. And CO2 doesn’t drive anything except faster plant growth. Noelle – Ira’s being facetious. Look under your rock and see if you can find your sense of humor. In the last two years, the U.S. government debt (on balance sheet) has increased by 40% (from ~$10 Trillion to ~$14 Trillion). CO2 has increased by about 1% (~4 ppm)and temperature has not increased at all statistically. I would not disagree totally that some reduction in military spending is in order, but you seem to skip over several items like the dept of education, HEW, energy, etc. Of the departments listed only the defense department is mentioned in the Constitution as being required to be funded. So lets start with eliminating all non-Constitutional spending first. What say you. Choosing two individual months as the basis for a trend seems rather like cherry picking. The change from the first MARCH to the most recent MARCH looks like -0.25 to 0.55 = a change of 0.8C. Neither of these is a good estimate for much of anything. Much better would be an annual average. Just eyeballing, I would say the average anomaly for the first 12 months is ~ -0.12ºC, and the eyeball estimate for the most recent 12 months is ~ 0.35ºC. So I would say that based on this, the increase is more like 0.45ºC, not the 0.1ºC you quote nor the 0.8ºC my picking a month with an especially big anomaly. Better yet, what is the slope of the linear regression for the data? What are the 95% confidence bounds on the slope? Then why isn’t this tagged as humor? It’s tagged for CO2 and global warming. YES, I do trust the satellite data in general and Spencer’s analysis in particular. Looking at his graph, take his first January (1980) anomaly, which is -0.1ºC, and compare it with the most recent January (2011) anomaly, which is 0.0ºC, and you get a net warming since satellite data came available of only +0.1ºC, a lot less than the +0.5ºC I have allocated to warming since 1880. Oh please that nonsense is indefensible. Someone should take your PhD away from you. “Matter at February 16, 2011 at 12:34 am accuses Ira of cherry picking the use of US temperature data. However, I am of the view that this is a valid exercise. What we need to know is where, when and how the globe is warming. Haha too funny. So we need to know how the globe is warming, by ignoring 98% of the Earth. Sadly I doubt your post was intended to be a joke. Please ignore the inanities spouted by John Brookes. He’s been infesting Jo Nova’s site for some time now and has absolutely nothing to offer other than brain-dead “arguments from authority”. I'm doing my part by leaving the refrigerator door open. I'm thinking of moving it outside where it will do the most good. It’s not tagged as being in English either – some things are rather too obvious to need signposting. Onion2, I am not suggesting that we should not examine warming trends from all over the globe. I am not suggesting that we only look at the US, but it is a valid exercise to look at the US unless there are cogent explanations as to why the experience of the US should not be typical. Onion2, I note that you do not offer any explanation as to why the temperature response in the US is significantly different to that of the global average, nor why the temperature response in the US does not seem to follow the principle undelying the AGW theory that increase in CO2 leads to warming. After all, the US has received its share of any increase in back radiation brought about by the increase in CO2 levels up to 390ppm. I presume Onion2 that you have no scientific explanation for the behavoiur noted in the US but if you do have scientific explanations, please detail them so that we can all consider their relevance. My view (and I have posted this many times) is that a temperature record for each country (may be in some cases a collection of countries) should be compiled and analysed rather than some global fudge. The effects of climate change (if there is any significant change) will be locally felt. For some countries it will be beneficial, for some neutral and for others it will pose some challenges. It is therefore much more important to see how each country/small area is being affected by temperature changes. This will probably also tell us more about the mechanisms involved. The reason why this is not being done is probably for political reasons to try and bolster the mantric, ‘we are all in this togther. It is a global problem etc’ when in reality that mantric is not true. Onion2, in making that final point, I am not suggesting that it follows that we should simply abandon those countries that face challenges to their fate. I am not saying that we should not help them deal with the challenges that they face. For present purposes, I am talking about the science, not the response. “Let’s first acknowledge the Globe and Mail Climate Rapid Reaction Team: it took them no time to publish Seth Borenstein’s article, a journalist from AP and their most rabid alarmist mouthpiece of Global Warming, itself a rehash of Quirin Shiermeier’s blog on Nature’s website! Noelle –Ain’t that a shame! I notice that the number of girls wearing shorts has increased rapidly in the last few years, and the shorts themselves have become shorter, so that they only just (or, in some cases, almost) cover the girls’bottoms. Is this correlated with weather patterns, and if so, is a cause or an effect? That’s not fair! Briffa needed only one tree, Mann his bristlecones, Jones didn’t even need any data or any recognizeable method, Hansen gets to do all kinds of strange things with his ever changing data and data base, and Steig certainly wouldn’t have any trouble at all in correctly spreading the U.S. data over the whole world, that is, if it could only be shown to give the correct result! So it should be especially obvious to you, onion2, that the real problem with using all of that U.S. data which shows not much temperature change, is that it means too much of the wrong kind of data within that 2% of the Earth is being used to construct the USGMT curve – by some very, very sad excuses for Climate Scientists! That must be Obama’s plan all along. To increase debt enough to buttress the arguments of the global warming crowd. If you like that correlation, try correlating temp anomaly vs. World population. It’s a tight fit and focuses the debate . . . We just need to eliminate the people. Of course we had a Republican House AND Senate at that time. So Brad, please send lots of your money to the Republicans to assist with the 2012 Senate campaigns. We your help we CAN do it!! Frank and Brad: The correlation I found is between NASA GISS US 5-year mean temperature and TOTAL US Debt, Public AND Private as a Percentage of GDP. Looking at the graphic, you can see there has been a continual increase in that measure since 1970, which includes the latter part of President Nixon and the terms of Presidents Ford, Carter, Reagan, Bush I, Clinton, Bush II, and Obama, so this is not a political partisan issue. I offered the correlation as an example of possibly spurious correlation, which does not prove causation, or, if there is causation, in which direction. The close correlation may indicate causation in the other direction. Perhaps it is rising Temperatures that cause GDP to go down and Total Debt to rise? Getting back to Climate Science, the ice core data shows that Temperature changes LEAD CO2 by 800 years or so, which indicates that increasing Temperatures may cause CO2 to rise hundreds of years later. Both Temperature and CO2 stay up for thousands of years, and then, while CO2 is at its maximum value, Temperatures begin to fall for hundreds of years and CO2, after a considerable LAG, begins to fall as well. That fact is one of the faults of former VP Al Gore’s An Inconvenient Truth movie, even acknowledged by the Warmists at Real Climate. Onion, why don’t you have a look at these two threads on Digging in the Clay. and if you use Google Earth why not download the actual KML files and look at the individual station data (and trends) for yourself (by clicking on the coloured dots within Google Earth). Provided you are prepared to take the time to look at these and to analysis the NCDC GHCN data yourself, you’ll see why the multi-decadel trends in continental US (CONUS) temperature data are so important in this whole man-caused global warming debate. Dismissing it out of hand as you are attempting to do because the surface area of the CONUS is only 2% of the surface area of the planet is foolish (remember that approx. 70% of the surface of the planet is covered by oceans/in-land lakes) and is only the sort of thing a CAGW alarmist like Hansen (and his helpers Reto and Sato) would do when confronted with errors in their GISTemp analysis of historical temperature post the year 2000 (the so called Y2K error http://climateaudit.org/2007/08/03/hansens-y2k-whopper/ and http://climateaudit.org/2010/11/11/y2k-re-visited/) and the failure of his post-1988 Congress testimony CAGW predictions (in which he was 99% certain) to come to fruition. The fact is there is (with the possible exception of the CONUS and some parts of western Europe.) very little multi-decadel (so called ‘long lived’) station temperature data that spans most of 1880 to 2010 NCDC GHCN time period available for most parts of the planet (http://diggingintheclay.wordpress.com/2010/01/21/the-station-drop-out-problem/). Other than the outputs from the ‘tuned to produce catastrophic global warming’ climate models, the whole case for man-caused global warming rests on the premise that the late 20th century warming period (from 1970 to 2000+) is ‘unprecedented’ in the last 130 years and Mann & Co would even have us all believe it is ‘unprecedented’ in the last 1000 to 2000 years. This claim is not supported by the actual (NCDC GHCN ‘raw’) temperature data as the actual temperature shows that there is no such think as ‘global warming’. At any given time in the last 130 years parts of the planet have been warming while other parts (of the planet) have been cooling at the same time and vice versa. The links I’ve provided above show clear evidence of multi-decadel cyclic warming/cooling trends – warming from 1910 to 1940, followed by cooling from 1940 to 1970, followed by warming from 1970 to 2000. Even Phil Jones (in his interview with Roger Harrabin) is prepared to admit that the late 20th century (1970 to 2000) warming trend is statistically indistinguishable from the early 20th century (1910 to 1940) warming trend. “Temperature data for the period 1860-1880 are more uncertain, because of sparser coverage, than for later periods in the 20th Century. The 1860-1880 period is also only 21 years in length. As for the two periods 1910-40 and 1975-1998 the warming rates are not statistically significantly different (see numbers below). Don’t forget the hot air emanating from the mouth of Al Gore. The base chart shows “Estimated CO2” levels prior to actual measurements begun in 1958 at Mauna Loa. There is no need to “estimate CO2” prior to 1958. Just go to Beck 2007, and you can use actual measurements made by hundreds of scientists over the last 180 years. The measurement in 1825 shows CO2 at 425 ppm, higher than it is today. I wonder how CO2 correlates with Internet IP addresses ? The base chart shows “Estimated CO2″ levels prior to actual measurements begun in 1958 at Mauna Loa. There is no need to “estimate CO2″ prior to 1958. Just go to Beck 2007, and you can use actual measurements made by hundreds of scientists over the last 180 years. The measurement in 1825 shows CO2 at 425 ppm, higher than it is today. Charles: Thanks for mentioning Beck’s CO2 data based on chemical analysis. Anthony posted this about the Beck data in 2008, reproducing Beck’s graphic and writing: “…My personal opinion on this paper is that I’m ‘on the fence with it’, and I encourage a rigorous debate, pro and con. – Anthony”. Beck’s obituary was posted by Anthony in 2010. This Beck graph compares the Arctic ice core data (smooth, almost linearly increasing gray line, similar to my “Estimated CO2”) with Beck’s data (wavy red line that varies up and down and extends up to 100 ppm above the ice core data). I would appreciate it if WUWT readers would provide any information that may confirm Beck’s analysis. Until I see better evidence, I tend to discount Beck’s data, but I have an open mind. Beck’s data uses chemical measurements from a variety of places which are subject to horrendous amounts of noise. In fact, about the same amount of noise as you get moving around a major city (or by measuring from one spot and having wind direction change) – location alone can explain the entire variance. Such changes in atmospheric composition cannot be explained by any known volcanoes, and are equivalent to ~10% of vegetation biomass in the world decomposing in a single year iirc. Occam’s razor says Beck’s results are not global. Linear regression gives a much better idea than cherry picking 2 months. It’s +0.14 C for the UAH period of ~20 years, i.e. approx +0.5 C.
But of course, atmospheric temperatures are very noisy and a lot of this isn’t related to climate change, but to internal heat transfers. Sea level is a much better diagnostic of climatic change (albeit with a lagged response thanks to the cryosphere and so on). This may not be as far fetched as it sounds. I found a similar close correlation between temperatures and jet fuel usage… think about it…. So when the economy grows, folks fly more and airports are hotter (where we increasingly keep our thermometers…) AND we borrow more money when we all feel good ( think “housing bubble”). Then when the bubble pops, we slow down our travel and cut fuel use cooling the airports a bit (and spend a few years trying to get debt levels back under control and rebuiding the GDP growth). “a circle has one corner?” No, that’s a teardrop.